We bring you last week's top former Sharks players who are currently playing in pro basketball. #1. Clifford Hodge (6'5''-PF-88, graduated '10, plays pro in Philippines) managed to help Meralco Bolts in a victory against the closely-ranked TNT Ka Tropa (2-3) 88-77 in the Filipino PBA in Wednesday night's game. He scored 5 points and grabbed 13 rebounds in 33 minutes. Meralco Bolts (2-2) are placed sixth in the PBA. It's Hodge's seventh season with the team. 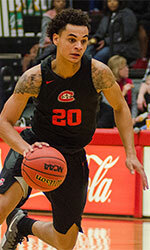 This year Hodge averages 7.8ppg, 10.3rpg and 3.3apg in four games he played so far. He is a naturalized Filipino. #2. Niksha Federico (6'7''-G/F-95, graduated '18, plays in Spain). He could not help Araberri (6-14) to beat CB Granada (12-8) in the Spanish LEB Gold (second division). Federico scored 6 points. Araberri was crushed 86-59 on the road by the much higher-ranked CB Granada (#7). It's Federico's first season with the team. He has relatively good stats this year 11.8ppg, 6.8rpg and 1.4spg. Federico is a naturalized Italian. #3. Nikola Urli (6'7''-F-94, graduated '18, currently in United Kingdom), who plays in the British NBL D1 (second division) was not able to help Team Newcastle University (5-9) in their last game. Despite Urli's very good performance Team Newcastle University was badly defeated 76-58 in Derby by the higher-ranked (#6) Trailblazers. He was the top scorer with 15 points. Urli also added 8 rebounds and 3 assists in 24 minutes; quite an impressive performance considering it's only his first season in pro basketball. Urli has relatively good stats this year 13.0ppg, 7.3rpg, 2.7apg and 2.3spg in three games. #4. 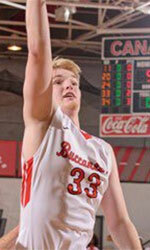 Fran Urli (6'8''-F-89, graduated '12, plays pro in United Kingdom) is a teammate of previously mentioned Nikola Urli and both played together in the last British NBL D1 game. Urli was not able to secure a victory for Team Newcastle University (5-9) in their game against Derby Trailblazers (8-7). He recorded only 4 points and grabbed 4 rebounds. Team Newcastle University was badly defeated 76-58 in Derby by the higher-ranked Trailblazers (#6). This season Urli averages 8.0ppg and 3.2rpg. Worth to mention he played also at Eurobasket Summer League, which helped him get the job in pro basketball. Notice: The list above includes only some of the Hawaii Pacific University alumni playing currently in pro basketball. Check COMPLETE LIST.